Journalists, sports fans and even athletes themselves are constantly hearing medical terms that call for greater understanding. We hope this book serves that need. 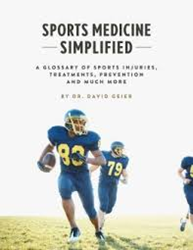 Renowned orthopedic surgeon and sports medicine specialist Dr. David Geier has written a breakthrough guidebook called, Sports Medicine Simplified: A Glossary of Sports Injuries, Treatments, Prevention and Much More. A Kindle edition (ISBN: 978-0-9914360-1-9) is available to the general public though Amazon.com, BN.com, and other websites that sell Kindle books sells for $4.99. Matt Garland and Mindy Holahan assisted as project editors, with Jonathan Wondrusch as illustrator. Dr. Geier has served as Chief Tournament Physician for the Family Circle Cup women’s professional tennis tournament for seven years and also as head team physician for the Charleston Battery professional soccer team. He has served as a physician for USA Rugby and the U.S. women’s national soccer team during their appearances in Charleston, SC. In his sports medicine fellowship, he worked with the medical teams who provided care for the St. Louis Cardinals and St. Louis Rams. At his practice in Charleston, Dr. Geier treats athletes of all ages and skills levels. While he treats musculoskeletal injuries throughout the body, he particularly focuses on knee and shoulder injuries and the arthroscopic surgeries to treat them. He is also especially passionate about youth sports injuries. Additionally, Dr. Geier is a prolific writer on matters of fitness, health and sports injuries, contributing regularly to his hometown Post and Courier, blogging, and serving as a go-to neutral source for media outlets whenever high-profile injuries occur. His overviews of the nature of injuries along with typical rehab procedures and expected healing time, have made him a key resource for journalists on deadline, dealing with breaking news involving sudden injuries for athletes. ACL reconstruction - surgical treatment to create a new anterior cruciate ligament. Surgeons use tissue from the patient's knee (autograft) or from a cadaver or donor (allograft) to essentially make a new ligament and restore stability to the knee. Return to sports typically takes six to 12 months from the time of surgery. The surgeon has reconstructed a torn ACL using a patellar tendon autograft. ACL tear: a traumatic rupture of the anterior cruciate ligament in the knee often caused by a noncontact mechanism such as landing from a jump or planting the foot to change directions. Surgical treatment requires ACL reconstruction. The glossary is organized alphabetically, and “clickable” by alphabet to go right to the entry. Within each definition, related terms appear in a highlighted form. Click on those terms to read more about them. Dr. David Geier is an orthopedic surgeon and sports medicine specialist in Charleston, SC, who recently started his own practice after spending eight years as Director of MUSC Sports Medicine at the Medical University of South Carolina. He holds a board certification from the American Board of Orthopedic Surgery in Orthopedic Surgery, as well as a subspecialty certification in Orthopedic Sports Medicine. He maintains an oft-visited website (http://www.DrDavidGeier.com). Dr. Geier serves as Chairman of the Public Relations committee for the American Orthopedic Society for Sports Medicine. He also serves on the Outreach committee for the STOP Sports Injuries campaign, the Publications committee for the American Orthopedic Society for Sports Medicine, the Sports Medicine Evaluation committee for the American Academy of Orthopedic Surgeons, and the Medical Aspects of Sports committee for the South Carolina Medical Association. He is actively involved with sports medicine journals and health publications. He is a member of the editorial board of the Orthopedic Journal of Sports Medicine: An Open Access Journal for Orthopedic Sports Medicine, Arthroscopy and Knee Arthroplasty and Outpatient Surgery Magazine. He is a principal reviewer for the American Journal of Sports Medicine and a reviewer for Sports Health: A Multidisciplinary Approach. He writes a regular newspaper column for The Post and Courier and contributes articles as the Orthopedics Category Expert for Answers.com. He also writes articles and columns for Bleacher Report, Outpatient Surgery Magazine, Becker’s Orthopedic Review, and others. Dr. Geier has been interviewed by The Wall St. Journal, USA Today, The New York Times, Washington Post, Boston Globe, New York Post, AP, CNN, NBC, ABC, Huffington Post, US News & World Report, Forbes, Bloomberg Business Week, Reuters Health, Yahoo! Sports, FOX Sports, CBS Sports, ESPN, MLB Radio, SiriusXM, Women’s Health, Men’s Health, Men’s Fitness, Men’s Journal, Prevention, MSN Healthy Living, Health Magazine, and WebMD.